For more than 20 years PROGEO has been the leading company for advanced technologies of waterproofing monitoring systems in buildings and infrastructure. 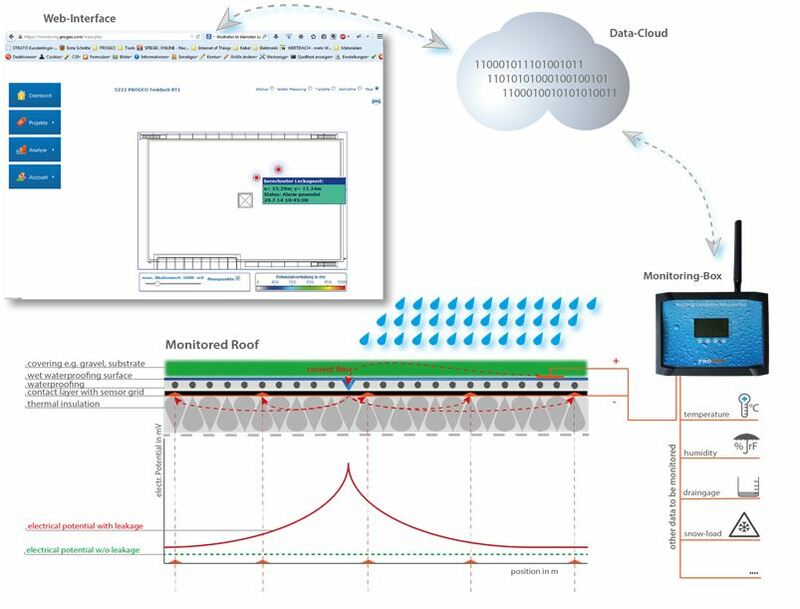 Our award winning monitoring solutions enable the early detection and location of leaks in waterproofing systems. It significantly increases the safety and security of environmental waterproofing systems and enables smart proactive strategies for building- and infrastructure maintenace. Sealing systems are electrical isolators as long as the do not leak. If charged with an electrical voltage, no current can flows. If a leak happens, water goes through the membrane and electrical current starts to flow, as water is electrical conductive to a certain extend. While flowing from the plus pole on the one side of the membrane to the minus pole on the other side, the current flow creates differences in the electrical potential in the materials facing the membrane below and above. These potentials are measured with a set of sensor nodes applied close to the membrane when being installed and connected to microcontroler driven monitoring box. As the position of the sensors is known, the monitoring box is able to calculate the potential distribution for the whole surface of the membrane when a whole set of data is taken by the system. This distribution clearly shows whether there are any in the membrane and if so, which position they exactely have. PROGEO monitoring technology is even more than a fascinating measuring principle. It is an adopted technology, designed to perfectly fit into the different applications, it is used for. Robustness and reliablity of the physical principles combined with durable, especially constructed components guaranty a maximum lifespan even in missioncritical applications under the whorst physical, chemical and biological stresses. Efficient and safe design-, installation- and quality control procedures asure a safe and timesaving installation and setup of the systems, whereever they are installed in the world. With permanent access to the internet monitoring systems based on PROGEO technology can be kept runnig and maintened with low efforts. This asures highest reliablity and availabilty and best customers satisfaction.